In Electronic Dance music you can hear the transients as the ‘click’ or ‘punch’ of the kick-drum in the higher frequency regions, or the ‘click’ or ‘tock’ of the clap. Or for example on the letter ‘t’ if you pronounce the word ‘transient’. These transient can make certain sounds pop out of your mix, but because of their nature, their peaks in volume can also be problematic for your mixes. Like with everything in music, balance is key here. Not every sound needs to pop out, because if every sound pops out, none really do, yet it drives the peak level of your mix higher and higher. For some sounds the opposite might be true; you want them to pop out a little more. 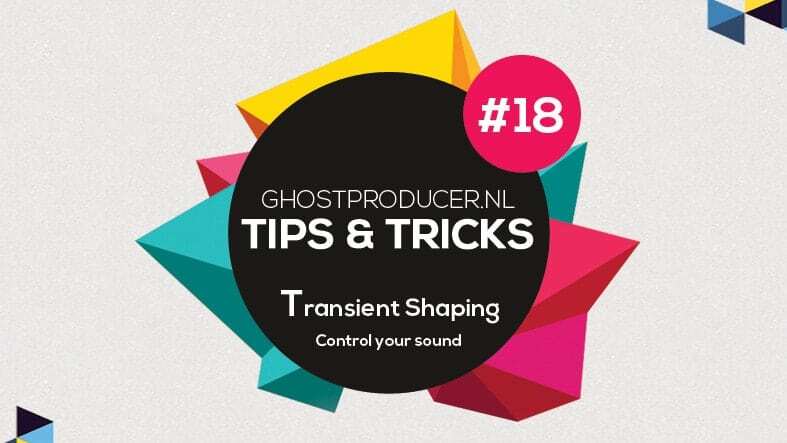 We’ll be looking on how to use transient shaping to improve your mixes. Essentially transient shapers are compressors with a very specific function. They use an algorithm of upward expansion in order to take a signal above a certain threshold and increase the gain even more; this way it can enhance your existing transients. Or they use an algorithm of downward compression to contain your transients and bring them down. Other than that; most modern transient shapers are offer a tool to manipulate both the ‘attack’ as well as the ‘sustain’. Using the attack knob on most transient shapers, you can manipulate the initial ‘transient’. Bringing it up to add punch to percussive instruments or kicks or bring back some life and dynamics into overly compressed sounds. The sustain knob on the other hand controls the sound after the initial transient. Bringing up or down the volume after an initial transient. On tom drums for example; bringing up the sustain will result in a more stretched, longer sounding tom. Bringing down the sustain however will result in a shorter and snappier tom sound. On live drums bringing up the sustain will result in more room sounds, bringing it down will result in a snappier cleaner sound. As you can understand; this sustain tool is ideal to influence the length of your samples making it easier to clean up your mix. In Electronic Dance Music transient designers are ideal to make your mixes stand out. Adding some punch to instruments that need them, softening the transients on sounds that don’t. Personally I use transient shapers on my percussion the most. Improving the transients on my kicks, claps, hihats. Reducing transients on my cymbals, FX and other sounds that don’t need it. Also on a lead sound it can be ideal to have some more control on the initial transient and the sustain of the sound. Either way; it’s a great tool to get some more control over your sounds and improving your mix-downs. I hope with this explanation you’ll have more of an understanding how transient shapers work and how this will affect your mixes. So, that’s it for now. Hope this information helps you with your tracks. Happy producing! And if you need any help, you know where to find me!